Press and hold on your keyboard to bring up the “Start ? Run” window. 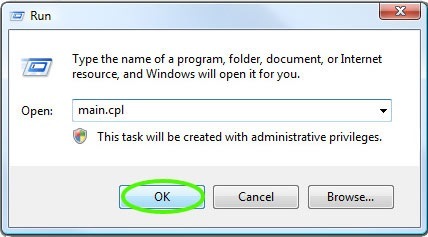 Type “main.cpl” in the Open: box then hit the OK button. If you have a Microsoft® mouse and you have the Intellipoint® software already installed, you will see a window like the one pictured below. If you have a Microsoft® mouse and do not see the window, or you have a different brand of mouse, see below. Use the Large thumb button: pull down menu to choose a new action it will perform. You can choose to disable the button entirely (pictured on the right) or pick whatever strikes you as being more functional and less catastrophic if accidentally clicked. For example, the Flip3D option, lets you switch between open windows using a 3D flipbook style interface. Click the Apply button in the button left hand corner of the screen… Now squeeze and misclick away hamburger hands, you’re in the clear! If you do not have a Microsoft® Mouse and have checked all of the tabs in the mouse window that appears and there is no mention of a third mouse button you need to download the mouse driver for your mouse from your mouse’s software vendor.